The Renewable Heat Incentive (RHI) is a UK Government incentive scheme designed to reward those who use renewable energy to heat their buildings and encourage uptake of renewable heat technologies among householders, communities and businesses through the provision of financial incentives Initially only industrial, commercial, public sector and community organisations will be eligible to apply, but a second phase will allow residential homes to benefit too. The RHI will guarantee regular 'tariff' payments for 20 years based on the amount of renewable energy they generate. Phase 1: Non-Domestic: the introduction of the RHI for installations in the industrial, business and public sectors. Phase 2: Domestic (UK Home Owners): this element of the RHI, is expected to be introduced in the spring of 2014 following the UK Government consultation published in September 2012. This provides financial incentives to eligible, non-domestic renewable heat generators for the life of the installations or up to a maximum of 20 years. So not only are you saving money on your heating bills by using a lower cost fuel, you will be paid for being green as well. Non-domestic sectors include industrial, commercial, public and non-for-profit sectors. A non-domestic installation might be a large-scale industrial heating systems or a smaller community heating project. RHI rates published by Ofgem for the year from 1 April 2013 – rates will change with inflation each year. The domestic RHI is a UK Government financial support scheme for renewable heat, targeted at, but not limited to, off gas grid households. 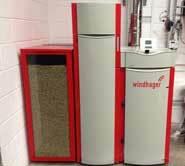 You install a biomass boiler with a capacity of 175kWth. Because of the capacity, it’s on the ‘Small Biomass’ tariff. You use the boiler for 2000 hours in 1 year. Making a total of £22,416.80 per annum (paid over a 20 year period) = £448,336.00 (plus inflation adjustment). The tariff table will be reviewed by the Government, who will decide if the tariff levels need to be changed. The first review will take place in 2012. The tariff level at present is as the below table and is set from the date of registration for the full 20 years. Accreditation for the RHI can be obtained from Ofgem, who are responsible for administering the scheme. Ofgem started receiving applications on Monday 28th November 2011, for industrial, commercial, public sector, not-for-profit and community installations. Information on how to apply for support, plus detailed guidance documentation to help you through the process, can be found on the Ofgem website.